"It is not the challenge of dollars ... it is the challenge of ideals and ideas! If the producers of pictures, see only the dollar - then I believe those production efforts will fail." Their only bankable movie star was the four-legged hero Rin Tin Tin. 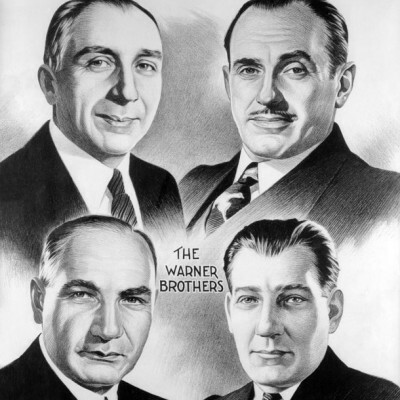 But in April 1923, four visionary brothers from Youngstown, Ohio officially incorporated their new motion picture company, which would eventually grow into the media empire Warner Bros. By the end of the decade, Warner Bros. hit it big with the sound of The Jazz Singer, the gangster personas of Edward G. Robinson and James Cagney, the kaleidoscopic escapism of Busby Berkeley, and their lurid melodramas of taboo and defiance. Their legendary films became a microcosm of America’s cultural and social history, mirroring – often challenging – the values and attitudes of the period in which they were produced. The colorful 85-year legacy of Warner Bros. is documented in an unprecedented series, You Must Remember This: The Warner Bros. Story, a presentation of AMERICAN MASTERS. The five-hour film is a Lorac production in partnership with Warner Bros. Entertainment and premieres nationally, September 23, 24 and 25, 2008 at 9 p.m. (ET) on PBS (check local listings). Award-winning filmmaker and film critic Richard Schickel is the director, writer and producer. Clint Eastwood is the executive producer and narrator. “I think it’s wonderful and fitting that Richard Schickel, who produced his first big series The Men Who Made the Movies for public television in 1973, is returning to public television with this project – the epic and historic and thoroughly juicy Warner Bros. story,” says Susan Lacy, Creator and Executive Producer of AMERICAN MASTERS, a five-time winner of the Emmy Award for Outstanding Primetime Non-Fiction Series. The film is the centerpiece of a year-long celebration of the studio’s 85th anniversary. A companion book of the same title, written by Schickel and George Perry with an introduction by Eastwood, will be published worldwide this September by Running Press. Through movie clips, rare archival interviews, newly photographed material, and insightful on-camera discussions with talent such as Martin Scorsese, Steven Spielberg, George Clooney, Warren Beatty, Clint Eastwood, Sidney Lumet, Jack Nicholson, and many others, You Must Remember This gives us the history of 20th century America on the big screen. Each episode focuses on a specific period in the studio’s momentous history: the silent movie days and the development of sound, the Depression, World War II, the advent of television, the onset of new technologies, and the broadening and diversification of media companies in recent years. In the 1930s and ‘40s Warner Bros showed the country holding itself together under terrible economic and societal pressures, then celebrating its triumphs over evil in the war years. Film classics such as The Maltese Falcon, Key Largo, Casablanca, Now, Voyager, Mildred Pearce, and To Have and Have Not portrayed the era with palpable realism. Throughout the 1950s, ‘60s and into the ‘70s, the studio fought the looming threat of television with new technologies, new sensibilities and the launching of a new breed of movie star. You Must Remember This tells the studio’s story from Cinerama and Eastman Color to Bonnie and Clyde and Who’s Afraid of Virginia Woolf and through some of Hollywood’s most magnificent stars – John Wayne, James Dean, Warren Beatty, Elizabeth Taylor, Doris Day, and Jane Fonda. By the next decade, Warner Bros. was again the hottest, most adventurous studio in town, right back where it had been in the 1930s and ‘40s. Breaking new ground with the music documentary Woodstock and Oscar-winning films such as All The President’s Men, Dog Day Afternoon, The Exorcist, and Batman, the studio moved toward the 21st century, capturing the imagination of a new generation of audiences. From Dirty Harry to Harry Potter, Warner Bros. created a string of blockbuster productions that thrilled spectators around the world while the excitement of The Fugitive, the complexities of Reversal of Fortune and the edginess of The Matrix also led the way to a new Hollywood establishment that includes Clint Eastwood, George Clooney and Julia Roberts. Episode One introduces the four brothers and the characters and films that established their studio’s success. Warner Bros. becomes home to celebrated stars Bette Davis, Humphrey Bogart, Errol Flynn and more. The studio – like the world – faces the twin catastrophes of the Depression and World War II, as well as the blacklists and political witch-hunts. TV arrives. Warner Bros. fights back with new technology (CinemaScope, 3-D, Eastman Color) and new stars (girl-next-door Doris Day and teen icon James Dean). The studio releases breakthrough films like Who’s Afraid of Virginia Woolf? and Bonnie and Clyde. What the ’60s start, the ’70s bring to flower. The film Woodstock signals a new era, while new talent (including Clint Eastwood, Martin Scorsese and Stanley Kubrick) and management spark a return to taking chances and setting trends. Tent-pole films. Weekend grosses. Megabudgets. The ’80s usher in modern moviemaking and marketing. Box-office smashes Superman, Batman and The Matrix become franchises. The Harry Potter series enthralls the world. Clint Eastwood creates a succession of Oscar®-winning instant classics. And studio collaborations with George Clooney and more new talents pave the way to a future as fabled as the past.